You taint Scalia's life. He was the strongest Originalist on the court, and his decisions and reports are taught in Law Schools and support the Constitution. Your post suggest you listen to those in Huffington Post and other Leftwing sites that tried to dirty Scalia as soon as he died. They said what you did about Heller and Boumediene v. Bush. In Heller, he struck down the D.C. ban on hand guns, and in so doing cast aside the key 1939 precedent of United States v. Miller, which rejected the individual rights theory of the Second Amendment in Heller. In Boumediene each Gitmo detainee will get a meaningful hearing, not the sham process of "Combatant Status Review Tribunals" that the administration hoped to use. Not the full-bore code of Citizenship legal status, just fair judicial review with the habeus corpus thrown in. Understand, Habeus Corpus is not in the Bill of Rights. It precedes it in the body of the Constitution. It is evident that those wishing to hurt Scalia's legacy would search out controversial cases - but Scalia was definitely one of the good guys. That's not true. Thomas is far and away the Originalist. After all, he's the only true Liberal on the court. Here's what I mean. Just take 1995's "McIntyre v. Ohio Elections Commission. In this one Thomas and Scalia were on opposite sides. And note that while Scalia was a true Federalist, Justice Thomas was and still is, an Anti-Federalist, i.e. a Liberal of the true fashion. Here's his concurring comments on the decision. Scalia's life is whatever it was. Scalia was a statist of the first order. if someone says they are into original intent, apparently that's all you need to assume they mean it. I don't, I go by what they do and Scalia never met a security or authority law, rule or regulation he did not support that gave the federal state more power over your life. You could post evidence where I am wrong. I'll admit it. (03-15-2016, 03:48 PM)John L Wrote: That's not true. Thomas is far and away the Originalist. After all, he's the only true Liberal on the court. Here's what I mean. The problem with States outlawing anonymous printed statements also involves habeus corpus, which Scalia was proud to defend. Remember there were two rights put in the body of the Constitution because they were considered too important to be part of an added-on Bill of Rights. They were Habeus Corpus and trial by a jury of peers. The British courts treated a litigated person as guilty, and who had to prove one's own innocence. Habeus Corpus compelled an accuser to face the accused. How does one do that if the accuser is anonymous? BTW, Thomas always has the clearest and most common-sense opinions. What, if I am ask, does "McIntyre v. Ohio Elections Commission" have to do with habeas corpus? The case, Utah v. Strieff, was occasioned when police stopped Salt Lake City man Edward Strieff on leaving a house suspected to quarter drug activity. The state of Utah concedes the initial stop was illegal, as the officers in question had no probable cause to seize and search Strieff. During the course of the stop, officers discovered Strieff had an outstanding warrant for a small traffic violation, and methamphetamine in his pocket. The Court was asked to decide whether the exclusionary rule — which prohibits police and prosecutors from using evidence obtained illegally — applies when an officer learns during an illegal stop that there is a warrant for an individual’s arrest, and finds additional contraband while executing the arrest on said warrant. The High Court ruled 5-3 that the arrest, and the evidence obtained during the arrest, were legitimate, even if the initial stop was not. Justice Thomas wrote the majority opinion, joined by the Chief Justice, and Justices Kennedy, Breyer, and Alito. With Scalia gone, and a 4-4 split - the Progressives are trying to get through many bills passed with a 5-4 majority which can be backed out because Scalia died before the cases were finalized. Sotomayor filed a peppery dissent, joined in part by Justice Ginsburg. Quote: ...The white defendant in this case shows that anyone’s dignity can be violated in this manner,” she wrote. “But it is no secret that people of color are disproportionate victims of this type of scrutiny. For generations, black and brown parents have given their children ‘the talk’— instructing them never to run down the street; always keep your hands where they can be seen; do not even think of talking back to a stranger—all out of fear of how an officer with a gun will react to them. We must not pretend that the countless people who are routinely targeted by police are ‘isolated,’” she continued. “They are the canaries in the coal mine whose deaths, civil and literal, warn us that no one can breathe in this atmosphere. Just another case of the fruit of the tree defense. A guy is definitely guilty, but the all-Holy technicality is more important than justice. Even in this, Sotomayor uses it to champion Black Lives Matter. She lost 5-3, but still wants to roil the water. Which one do you want to delete Bill? Now, here's something that Jackasses may want to invest their future ability in which to regain control of the Supreme Court. Personally, I find this to be quite scary. Quote: ...........A KeepOurRuth.org spokesperson held a press conference this morning with the following statement about the procedure's purpose and potential benefits. "We all know she's been a bit wobbly the last few years, but we need her on the Supreme Court. Since we can't possibly pass most of our revolutionary ideas in Congress, we need like-minded jurists in the courts to force those ideas on a grateful public. We've been doing that at the Federal Judiciary level for decades, but the Supreme Court is like a weapon of mass destruction for this type of stuff. They can really put a smack-down on all this ‘rule of law’ nonsense if properly staffed. 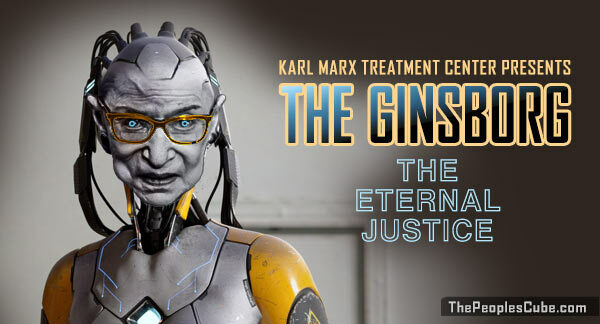 A Ginsburg Cyborg could stay on the court indefinitely as long as spare parts are available." Oh Boy! I'm looking forward to watching the next Supreme Court Nominee process. The Senate Judiciary Committee is getting a new chairman, and he is not putting up with any schist. The Jackasses had better learn to be gneiss. Yeah, can't have any of that "rule of law" stuff. Better to have "rule of what I think"! This ought to really get Progressive Juices stirred up: Trump is in the process of changing the 9th Circus Court. Quote: In fact, we even identified candidates selected by the White House we could support to demonstrate our willingness to work cooperatively. Unfortunately, the White House is moving forward with three nominees to a circuit court who have no judicial experience. The White House’s decision to push these nominees fails to secure consensus on the circuit court.